People from all sections of the country in recent times have expressed their anger and protested against the ill-treatment they have been subjected to by the Modi-led BJP government. These include farmers, workers, dalits, religious minorities, teachers, and unemployed youth. 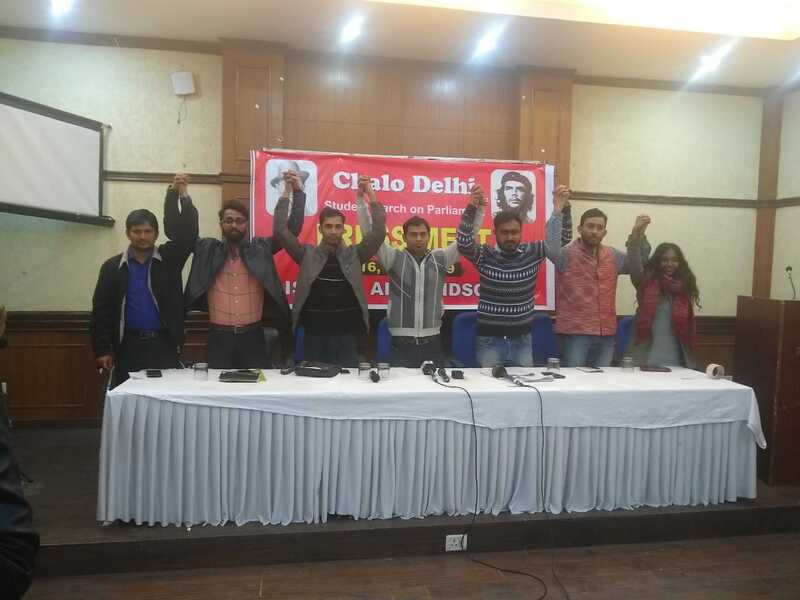 In keeping with these protests, several student organisations including the Students’ Federation of India (SFI), All India Democratic Students Organisation (AIDSO), Progressive Students’ Union (PSU), All India Students Bloc (AISB), and All India Students Federation (AISF) will march to the Parliament in Delhi on February 18, against the continuous systemic attacks by the Modi government on higher education and its anti-student policies. Students have been one of the worst affected sections in the recent past, under the BJP-led National Democratic Alliance (NDA) regime. There have been a series of attacks on the education system and institutions, sabotaging the very idea of education and the role it plays in the society. These attacks range from reduction of seats in higher education and complete dismantling of the reservation system to drastic reduction of funds for public-funded educational institutions. 1. Establish a nation-wide fully state-funded and free Common Education System from KG to PG. 2. Increase government spending to at least 6 per cent of the GDP and 10 per cent of the central budget on education. 3. Ensure guaranteed employment to all. 4. Stop communalisation of education. 5. Implement existing reservations properly and ensure social justice in government as well as private institutions. 6. Release the money for all pending scholarships immediately and establish more fellowships for research scholars from deprived backgrounds. 7. Protect federal character of education and resist centralisation of education. 8. Stop gender discrimination and atrocities on girl students. The organisations said in their statement, “After the historic protest marches of workers and farmers, the national capital will witness the rage of people in education sector on February 18 and 19. Students will be mobilised from across the nation for a massive students’ march to Parliament on February 18.” The central slogan of this campaign is “Save Education, Save Democracy, Save Nation”.